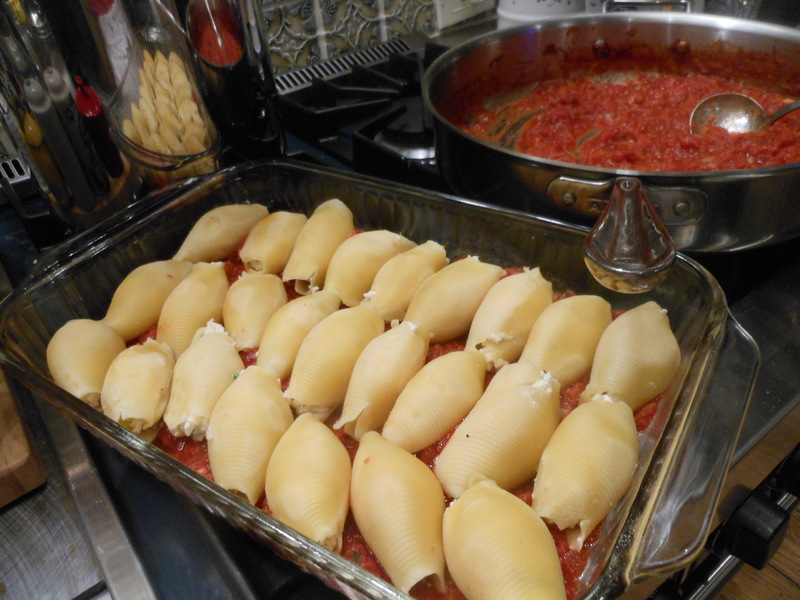 OK you must be thinking is she kidding – Stuffed Shells? gotta be the most fattening food to eat , and it probably is outside of lasagna, baked ziti and the like. Super delicious and sometimes you just hafta roll with it. I wanted a crowd pleaser, vegetarian and something that can easily be made ahead and frozen. My mind wanders to yummy, gooey food with a lot of cheese because who doesn’t love a lot of cheese. Ah , yes Stuffed Shells. I wouldn’t cook like this all the time, but once every blue moon no one is getting hurt, right? I served with a salad , no need for bread and butter here. 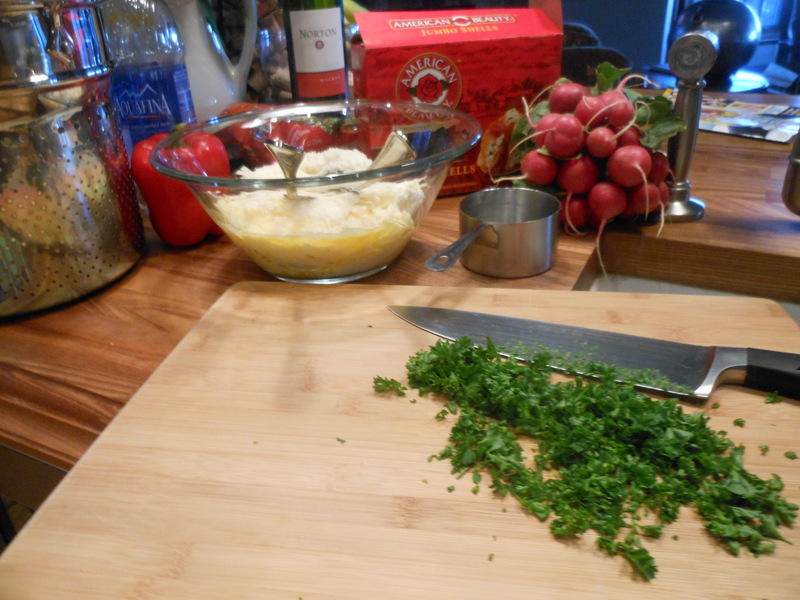 Homemade Maple Syrup Salad Dressing ( see on blog) and it was really pretty awesome. Took a few hours to prepare, mostly because I made my own sauce ( Sunday night sauce) but feel free to use a jar of prepared sauce if you must. This is a perfect meal to make ahead of time, and just pop into oven. If you use prepared sauce this would take app. an hour to prep. It is a bit time consuming stuffing all those shells. But well worth the effort. This would make a perfect dish for Christmas alongside any meat or fish entree. Of course if you love it with meat you can make a meat sauce and follow same directions. *marinara sauce or any red sauce I made my own and use my own recipe. If buying sauce and there are some delicious good sauces out there, you’ll need at least 1 jar and maybe a 1 1/2 jars. I make a big batch of sauce and freeze the remainder. It’s nice to have a little extra sauce in case you need it when you re-heat the stuffed shells. Prepare Pasta , cook for between 12 and 15 minutes, you’ll want them soft but not undercooked at the center. Drain pasta and cool for easy handling. Combine ricotta, 1/2 of the mozzarella, 1/2 of the Parmesan, parsley and egg in a bowl. Taste for Salt and Pepper. When shells have cooled down, fill them with rounded spoonfuls of cheese mixture and arrange them seam side down in casserole dish. I used a 9 x 13 Pyrex. 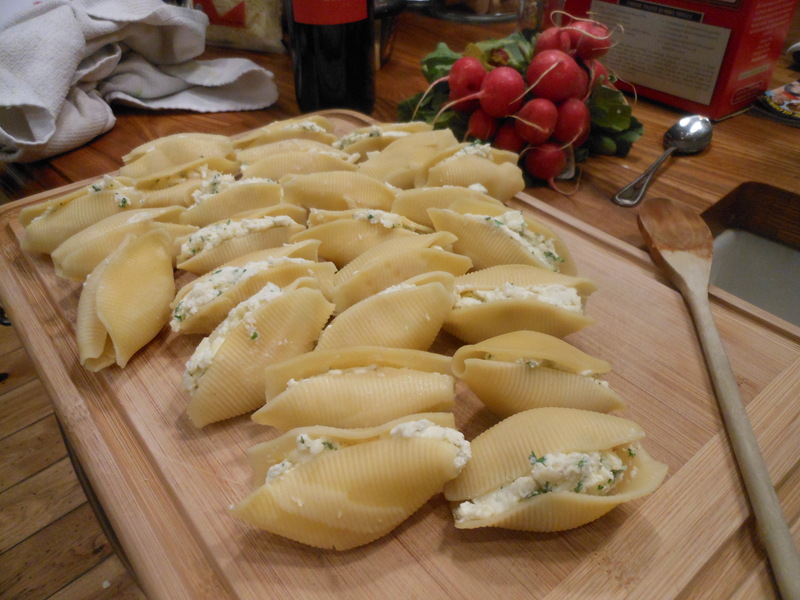 Top Shells with remaining sauce and remaining mozzarella and grated cheese. Place shells in very hot oven . You can turn on broiler for last few minutes , it should be slightly browned and bubbly. 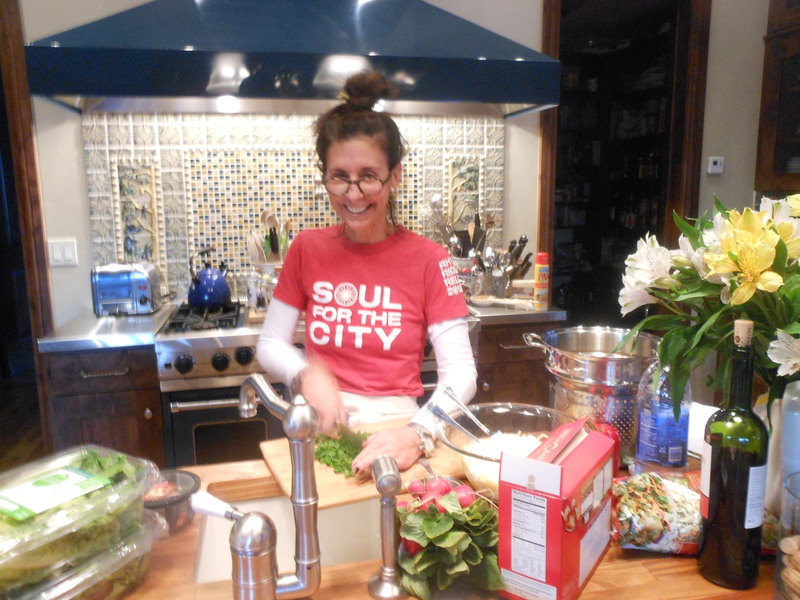 Let cool for a few minutes before serving. This entry was posted in pasta and tagged baked pasta, Saucy Stuffed Shells, Stuffed Baked Meatless Pasta, Stuffed Baked Shells, Stuffed Pasta Shells. Bookmark the permalink.